PM confirms Israel behind airstrikes against Iranian, Syrian targets following Iranian rocket attack. Israeli Prime Minister Binyamin Netanyahu said Israeli forces attacked Iranian and Assad regime targets inside of Syria Wednesday night in response to a serious escalation by Iranian forces, confirming that the IDF was indeed responsible for a series of airstrikes in Syria. “Iran crossed a red line,” Netanyahu said in a video message Thursday evening. 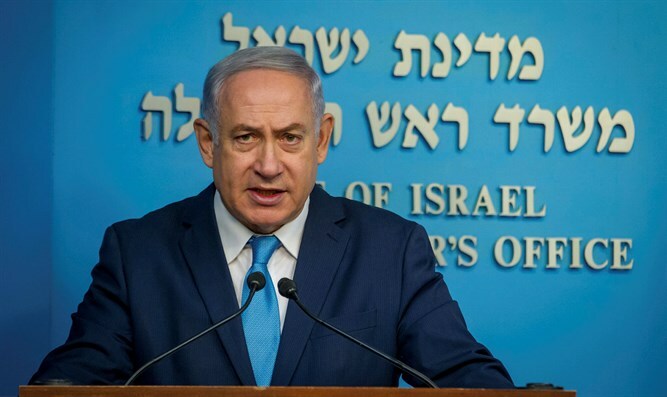 “Thanks to our military preparations for both defense and offense, the Iranian attack failed,” said Netanyahu referencing a series of rocket attacks by Iranian forces operating out of Syrian territory. Twenty rockets were fired at northern Israel Wednesday night, but none of the projectiles hit targets in Israeli territory. Four rockets were shot down by Israel’s Iron Dome missile defense system, while the remainder landed inside of Syria. Netanyahu said Israel would not tolerate an Iranian military force on its northern border. The Prime Minister added that while the strikes on Wednesday were directed primarily at Iran’s Revolutionary Guard, the Syrian regime would also be targeted if it provoked the Jewish state, noting that Syrian military targets were also struck. The Prime Minister urged foreign powers to back Israel’s use of force in response to the Iranian attack, and to take action against Iranian attempts to establish a major military foothold within Syria. During Israel's response to the Iranian rocket attack, Russian sources claimed that 28 Israeli aircraft fired 60 missiles at roughly a dozen targets in Syria, killing 23 people, including 18 Iranians and 5 Syrian soldiers.